The Brassicas (Broccoli, Cauliflower, Brussel Sprouts, and Cabbage) are being planted in clusters, or islands, instead of in long rows. We're planting companion plants such as onion, garlic, and flowers all around these islands to help increase helpful insects and reduce the spread of disease. Companion Plants, who benefit one another, have a 'Symbiotic' relationship. Over the past week we've transplanted over 100 seedlings from our greenhouse at the Devonian Botanical Gardens. The seedlings included Brussel Sprouts, Cauliflower, Broccoli, Kale, Cucumber, Squash (Winter Squash, Pumpkin), Basil, Oregano, flowers (Alyssum, Marigold, Meadow Blazingstar), Pepper, and Tomatoes coming out of our ears! We've also directly seeded many more plants in the last week such as Radish, Beet, Carrot, more Pepper, Leek, Corn, Potatoes, and more Cucumber. We still need to get Parsnip, Turnip, Rutabaga, Kholrabi, more Corn, onions, garlic, and flowers into the ground. We planted Potato seeds into our sheet mulched area and are hoping that they're strong enough to grow up through the thick woody mulch layer on top! This is the sheet mulched potato patch before the woody mulch was spread and the potato seeds were planted. Underneath the woody mulch is a thick layer of composted manure and a layer of cardboard directly over top of the alfalfa and grass. At the farm we're hoping to experiment and demonstrate alternative ways of growing food in a more regenerative way. One way we are trying to do this is through the use of companion planting. Companion planting is where you plant crops together that benefit one another whether it be by attracting insects like 'pest' predators or pollinators, or by providing beneficial nutrients to their fellow plants. This beneficial relationship is called Symbiosis. Along our major pathways and within the crop plots we are going to plant various, "companion plants" such as onion, garlic, flowers, and peas. 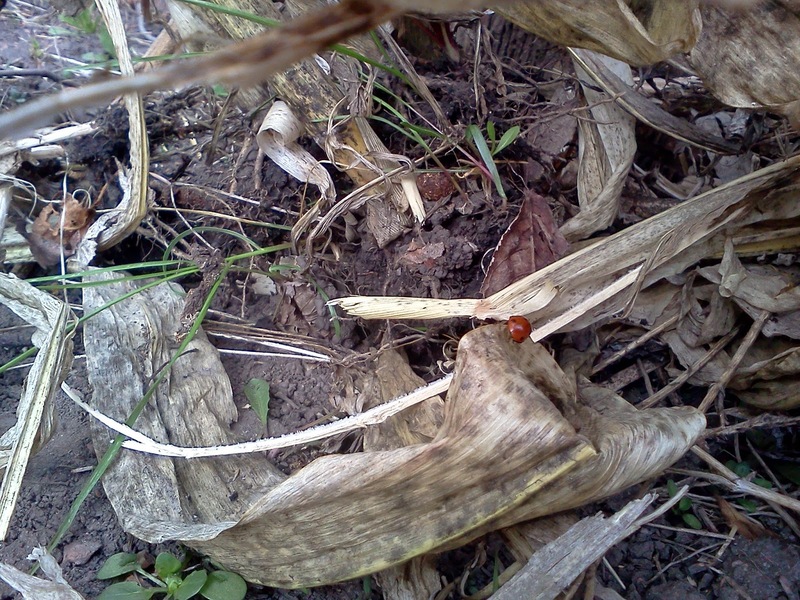 A ladybug crawls on old corn stalks from last year. Onion, garlic, and flowers like Marigold and Nasturtium attract predatory insects that feed on bugs that we often categorize as "pests". By providing homes and food for these predatory insects, we help create a natural interaction to help our plants thrive instead of relying on chemical pesticides. Peas are a type of legume, as are beans and clover. Legumes have helpful bacteria living on their roots called Rhizobia. These bacteria help the Peas take in and use atmospheric Nitrogen that other plants aren't able to access. This Nitrogen is then shared back into the soil as the Pea plant decomposes, becoming available to other plants around it. Legumes are often referred to as, "Green Manures" because of this Nitrogen they give back to the food system. We will be planting more seeds, shrubs, and trees over the next couple weeks. Come out to the farm and join us! We always appreciate meeting new volunteers and having help at the farm.